This classic boxing glove has been a Revgear staple for over 20 years and has a vintage boxing glove look. Made with durable vinyl and a water resistant lining, these boxing gloves have a pre-curved fit and an Ultra-Lock hook & loop closure for additional support and protection. These black boxing gloves come in pink, red, yellow, and white, or get the special edition all pink pair. Available in 10 oz, 12 oz, 14 oz, and 16 oz. Since 1996, Revgear has been empowering athletes at every level by providing high quality fight sport equipment that actually gets results. Our Deluxe Boxing Gloves are specifically designed to be comfortable enough for anyone to use and durable enough to last you a long time. Whether you’re sparring with a partner or working the bag, these boxing gloves will help you take your training to the next level! 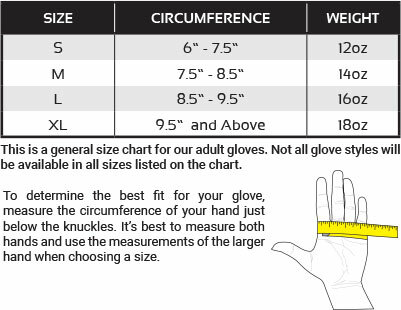 Size Chart Size: * 10 oz. 12 oz. 14 oz. 16 oz.